The Leopold Museum presents the first comprehensive exhibition on the Austrian artist Theodor von Hörmann (1840–1895), tracing his path from Realist to Impressionist through select works. During a stay in France between 1886 and 1890 he studied the Barbizon painters, the then still controversial Impressionists, and the representatives of the School of Tervuren. After his return from France he derived crucial impetus from German Impressionists and was introduced to the Secessionist ideas and would subsequently become an ardent advocate of this movement and a founding member of the Viennese Secession. His early death in 1895 prevented him from taking the final step into Modernism. Curated by Marianne Hussl-Hörmann. April 29th to Aug 29th, 2016. 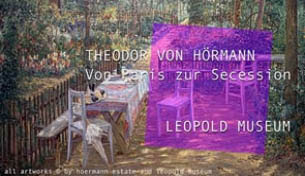 Das Leopold Museum zeigt eine umfassende Ausstellung des österreichischen Künstlers Theodor von Hörmann (1840–1895), die anhand ausgewählter Werke seinen Weg vom Realisten zum Impressionisten nachvollziehbar macht. Im Zuge seines Frankreichaufenthaltes von 1886 bis 1890 studierte er die Maler von Barbizon, die damals noch umstrittenen Impressionisten, und setzte sich mit den belgischen Vertretern der Schule von Tervueren auseinander. Nach seiner Rückkehr aus Frankreich führte ihn sein Weg auch nach München und Dachau, wo er mit deutschen Impressionisten und deren secessionistischen Ideen bekannt und in Folge zu einem vehementen Vertreter dieser Bewegung wurde. Er war an der Gründung der Secession in Wien beteiligt , sein früher Tod im Jahr 1895 erlaubte es ihm aber nicht mehr, den letzten Schritt in die Moderne mitzugehen. Kuratorin: Marianne Hussl-Hörmann. 29.04. – 29.08.2016. 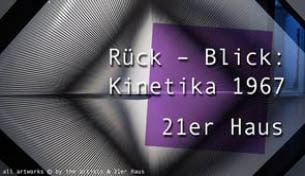 Retrospect: Kinetika 1967 at the 21er Haus gathers together 25 masterpieces of kinetic light art and op art. With light shows, optical illusions and veritable machines of perception the exhibition brings to life the way in which technology, cybernetics and visual research found their way to the other side of the screen and into art in the 1960s. Kinetika, the first international op art exhibition in Austria, which took place in 1967 at the Museum of the Twentieth Century, the predecessor of today’s 21er Haus. April 27th to August 28th, 2016. "Rück – Blick: Kinetika 1967" versammelt 25 Meisterwerke der kinetischen Lichtkunst und Op-Art im 21er Haus. Lichtspiele, optische Täuschungen und regelrechte Wahrnehmungsmaschinen zeichnen nach, wie Technik, Kybernetik und visuelle Forschung in den 1960er-Jahren jenseits der Leinwand Eingang in die Kunst fanden. Als historische Referenz dient Kinetika, die erste internationale Op-Art-Ausstellung in Österreich, die 1967 im Museum des 20. Jahrhunderts, in der Vorgängerinstitution des heutigen 21er Haus, stattfand. 27.04. bis 28.08.2016. 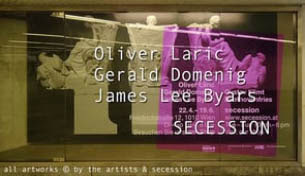 The SECESSION’s main hall is transformed into a sculptural grand assembly by Oliver Laric’s exhibition Photoplastik. Most of the 3D-printed objects bear a close relationship to Vienna, where Laric took his 3D scanner to the Kunsthistorisches Museum, the Albertina, and the Institute of Classical Archaeology. "Awåragaude?" by Gerald Domenig present photography, drawing, and writing. While his drawings are intended as drafts or preliminary sketches for fotos the photographs – most of them black-and-white – are not just snapshots capturing moments but aim at more than a rendition of reality, they are always self-contained images of a situation, a place. April 22th to June 19th, 2016. In der Ausstellung Photoplastik verwandelt Oliver Laric den Hauptraum der SECESSION in eine Skulpturenhalle. Die im 3D-Verfahren gedruckten Objekte stehen fast alle in enger Verbindung zu Wien, wo Laric mit dem 3D-Scanner Objekte im öffentlichen Raum sowie dem Kunsthistorischen Museum, der Albertina und dem Institut für Klassische Archäologie erfasste. Die Frage des Urheberrechts und der Gemeinfreiheit ist seit längerem ein zentrales Anliegen von Oliver Laric, der vor allem mit öffentlichen Sammlungen und Museen einen freien Zugang zu deren Sammlungsobjekten verhandelt. Zur Ausstellung erscheint ein von Oliver Laric gestaltetes Künstlerbuch. Die bevorzugten Medien des in Frankfurt am Main lebenden österreichischen Künstlers Gerald Domenig sind die Fotografie, die Zeichnung und das Schreiben (von Texten). Die Zeichnungen sieht er als Entwürfe oder Vor-Zeichnungen für seine Fotografien, während diese meist schwarzweißen Fotosn eben kein Festhalten eines Moments, nicht bloß ein Abbild der Realität sind. 22. April – 19. Juni 2016. 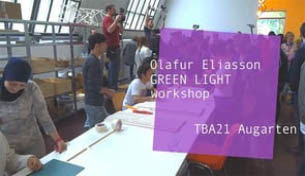 The Green light project at TBA21–Augarten consists of an artistic workshop and a learning platform surrounding the making of lamp modules designed by Eliasson. The lamps are assembled on-site by young refugees, migrants, and university students. Everybody is invited to take part in this process of collaborative artistic practice and learning, giving rise to a space of exchange and encounter for contributors from a range of linguistic, social, geographic, and educational backgrounds. The Green light lamps are made predominantly from recycled and sustainable materials and designed to be stackable, the modules can function either as single objects or be assembled into a variety of architectural con gurations. Within the framework of the Green light – Shared Learning program, artists, thinkers, students, refugees, migrants, and collaborating organizations are invited to host and to be part of a series of workshops, seminars, performances, screenings, lectures, and artistic interventions responding to socio- and geopolitical, cultural, and personal issues and narratives of migration and arrival through collaborative creative activities and critical discourse. All proceeds from the project go to supporting the educational platform of Green light–Shared Learning and the organizations such as Red Cross Vienna, Caritas and Georg Danzer Haus. You can order a Green light with a donation of €300 or participate in the artistic workshop at TBA21–Augarten, Vienna and benefit from a production price of € 250. Young refugee Hussein from Syria tells his story and his experience with the Green light workshop (in german!). 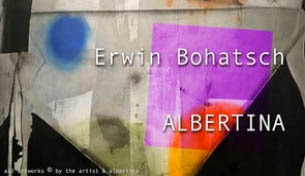 This exhibition at ALBERTINA juxtaposes Erwin Bohatsch’s latest works with representative examples from the past few decades to explore a multifaceted kaleidoscope representing 40 years of unique and consistent creativity. Bohatsch, born in 1951, numbers among the most important Austrian artists of his generation. His oeuvre is characterised by a constant back-and-forth between figuration and abstraction. April 8th to June 12th, 2016. Die Ausstellung "Erwin Bohatsch" in der ALBERTINA würdigt das vielseitige Schaffen des Künstlers aus vier Dekaden seines Schaffens. Bohatsch, geboren 1951, zählt zu den bedeutendsten österreichischen Künstlern, der bereits seit den 1980er Jahren internationale Anerkennung findet. 08.04 bis 12.06.2016. Artists: Siegfried Anzinger, Georg Baselitz, Herbert Boeckl, Günter Brus, Francesco Clemente, Martin Eder, VALIE EXPORT, Adolf Frohner, Nan Goldin, Mira Gáberová, Ilse Haider, Karen Holländer, Jörg Immendorff, Patricia Jagicza, Gudrun KampL, Alen Kasumović, Ronald Kodritsch, Anton Kolig, Elke Krystufek, Peter Land, Maria Lassnig, Marie Luise Lebschik, Daniel Lezama, Atelier van Lieshout, Rosa Loy, Marcin Maciejowski, Jonathan Meese, Virgilius Moldovan, Otto Muehl, Muntean/Rosenblum, Hermann Nitsch, Monika Pascoe Mikyšková, Irina Polin, Marc Quinn, Daniel Richter, Franz Ringel, Bianca Maria Samer, Martin Schnur, Rudolf Schwarzkogler, Peter Sengl, Max Streicher, Yang Shaobin, Herwig Zens. Curated by Andreas Hoffer. 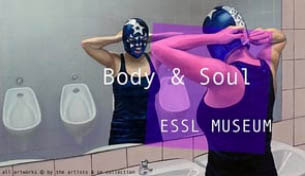 Mit der Ausstellung Body & Soul im ESSL MUSEUM wird der Themenkomplex Körper und Körperlichkeit beleuchtet. Die westliche Gesellschaft hat ihr Verhältnis zum Körper im 20. Jahrhundert grundlegend revolutioniert, neu definiert aber auch problematisiert. Diese Entwicklungen spiegelt sich auch in der Kunst, insbesondere in der Zeit nach 1945, wider... Kurator: Andreas Hoffer. 06.04.2016 - 30.06.2016. The ESSL Museum in Klosterneuburg closes at July 1st, 2016 after almost 17 years of exhibiting austrian and international contemporary art mostly from the in house Essl collection. Karlheinz Essl declared in a press conference that the Essl family, who build an funded the museum up to this day, is is no longer able to supply the needed money. The governement of Lower Austria has declared that it was willing to pay half of the bill, if the State would chip in the other half. Sadly the minister of culture was not willing to do likewise. The museum was an important cultural meeting place locally and for the whole region, not only for fine arts but also for new music and other cultural activities. Many young artists had their first shows in a museum here, the CEE award for young art had been the starting point of many successful careers. New impulses thru first exhibitions in this region by international artists or by artists from countries that had just recently come into focus of the international art scene had broadend the horizon of the many enthusiastic visitors. Only when its gone you will notice, how big the loss is! Still open till June 30th, 2016. In einer Pressekonferenz erklärte Prof. Karlheinz Essl heute, das das ESSL MUSEUM mit 1. Juli 2016 nach fast 17 Jahren Ausstellungstätigkeit mit österreichischer und internationaler zeitgenössischer Kunst den Ausstellungsbetrieb einstellt. Essl betonte, dass die Familie den Bau des Museums und die laufenden Kosten bisher aus eigenen Mitteln getragen habe, sich dazu aber in Zukunft nicht mehr in der Lage sähe. Das Land Niederösterreich sei zwar bereit gewesen, die Hälfte der Kosten zu übernehmen, leider sei der Bund nicht willens gewesen, die andere Hälfte zu übernehmen. Das Museum war in den letzten Jahren zu einem wichtigen kulturellen lokalen und regionalen Begegnungszentrum nicht nur für bildende Kunst, sondern auch für moderne Musik und andere künstlerische Aktivitäten geworden. Eine größere Zahl von jungen Künstlern konnten ihre Arbeiten hier erstmals in einem musealen Rahmen zeigen, der CEE Award war für viele das Sprungbrett für eine erfolgreiche internationale Karriere. Erste Ausstellungen von in der Region weniger bekannten internationalen Künstlern oder Künstlern aus Ländern, die erst langsam in den Fokus der internationalen Kunstwelt gekommen sind, haben den Horizont der vielen begeisterten Besucher erweitert. Was mit dem Esel Museum verloren geht, wird wohl erst gänzlich klar werden, wenn es unwiederbringlich seine Tore geschlossen hat. Bis zum 30. Juni 2016 ist es noch offen!